400 Gold Metallic Foil Laser Labels 4" x 5"
For use in Black or Color Laser Printers No Inkjets! Click here for our MS Word Templates, and Choose 400500. Avery® labels are manufactured by Avery. Avery is a protected trademark of that company. Label Outfitters® does not make Avery products. All our labels are 100% Guaranteed! Made in the USA! 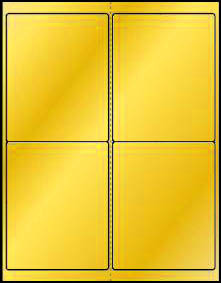 Silver or Gold foil labels provide elegant labeling options to many products. Give your child a Personalized Gold Sticker for a Reward.